This puzzle has a red frame in the shape of a cross containing 20 tiles. The centre of the cross 2×2 tiles large. The vertical arms contain a plunger with a block of 6×2 tiles which can slide up or down as a whole by two steps from its central position, so that all its tiles can reach the centre 2×2 square. The horizontal arms similarly have a 2×6 block of tiles that can be slid sideways two tiles in either direction. Every tile is split in half diagonally, one half coloured, the other half blank. This can be done in four different orientations, and indeed there are four tiles of each colour in the puzzle. Five colours are used, namely red, yellow, blue, green and purple, making up the 20 tiles of the puzzle. In the solved position the four tiles of each colour together form a diagonal square. This puzzle was sold on the 125th anniversary of the Red Cross (i.e. 1988) and they received part of the proceeds. It was invented by Athanasios Margaritis, patented on 20 October 1988, DE 3,711,368. There are twenty pieces which can be arranged in at most 20! positions for any given position of the plungers. In fact, only the even permutations are possible. There are 25 plunger positions, so there are 25·20!/2 = 30,411,275,102,208,000,000 positions all together. Sliding the horizontal plunger left or right by exactly one tile is denoted by L or R respectively. In the same way moving the vertical plunger up or down is denoted by U or D.
Phase 1: Solve one square. It is fairly easy to move a tile around without destroying previously placed pieces, so I will skip some of those details in the first two phases. It is actually possible to skip the first two phases all together, and use the techniques in phases 3 and 4 instead, but that is a lot slower. Put the plungers in the central position. Choose one colour, lets say red, and find the tile with the red triangle on the bottom left. Note that this tile belongs at the top right of a square when it is solved. Move that tile to the bottom right position in the right hand arm of the cross. Find the tile with the red triangle on the top left. Note that this tile belongs at the bottom right of a square when it is solved. If that tile happens to lie at the top right of the right arm then do LL DD RULUR DD LU RR U to swap the two tiles, putting them into their correct positions. Otherwise, bring that tile to the bottom left of the right hand arm, without disturbing the first tile. The two tiles can then be solved with the moves L DLUR R.
The next steps are very similar to steps b-f. Find the tile with the red triangle on the bottom right. Note that this tile belongs at the top left of a square when it is solved. Move that tile to the bottom left of the right hand arm of the cross. Find the tile with the red triangle on the top right. Note that this tile belongs at the bottom left of a square when it is solved. If that tile happens to lie at the top left of the right hand arm of the cross then do L DD RULUR DD LURU to swap the two tiles, putting them into their correct positions. Otherwise, bring that tile to the bottom right of the centre square, without disturbing the first three tiles. The two remaining tiles can then be solved with the moves DLUR. Phase 2: Solve another square. Turn the whole cross so that the arm with the previously solved square lies at the bottom. Use the method of phase 1 to solve another square, without disturbing the previously solved tiles. Phase 3: Separate the colours. Choose one of the unsolved colours. You will make the centre square this colour, so it is best to choose the colour that already occurs most often there. Find any tile of the chosen colour that is not yet in the centre square. Hold the cross so that this tile lies in the left arm of the cross. Now note the position of some centre tile that is of the wrong colour. To swap the two tiles, choose the move sequence from the following table that matches the positions of the two tiles. Repeat steps b-c until the centre is of one colour. If two of the arms of the cross still have a mix of colours, then do RR DD LL UU to bring one of them (the left arm) to the centre, and go back to step a. Eventually each arm of the cross will have only one colour. Phase 4: Solve the squares. 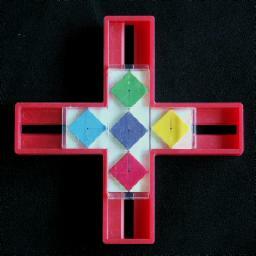 If the centre already has a solved square, then hold the cross so that an unsolved square is in the left arm of the cross and do RR DD LL UU, so that the centre now has one of the unsolved squares. Examine the pattern formed by the centre tiles, and look it up in the table below. If the pattern is listed, then the move sequence in the table can be used to solve it. You may need to rotate the cross to get the pattern to match. Note that these patterns are all even permutations. If the centre pattern could not be found in the table (i.e. it is an odd permutation), then one of the arms of the cross will also have a mixed pattern that is not in the table. Hold that arm of the cross on the left, do LDRU R URDL L DLUR RULD, and go back to step b.
Repeat steps a-c until there is a square of every colour. Phase 5: Rearrange the squares. Finally, if you wish to swap the centre and the left arm of the cross, do RUULDD RUULDD R RUULDD RUULDD L.